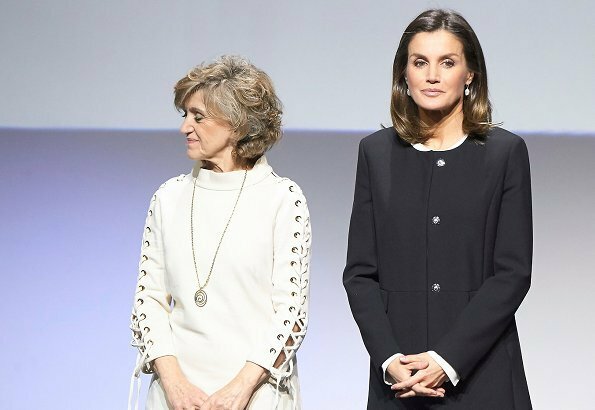 On November 22, 2018, Queen Letizia attended the award ceremony of the 10th "BBVA Integra Awards" held at Madrid BBVA City. 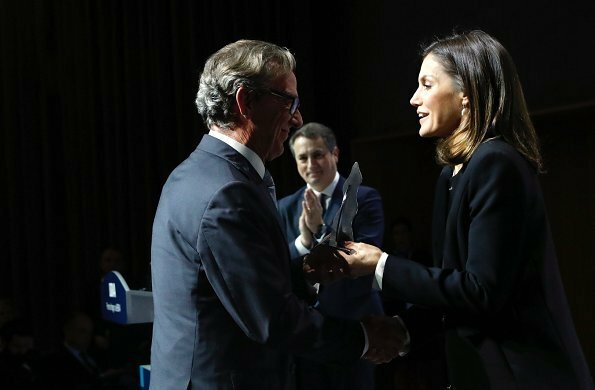 This year, BBVA Integra Awards celebrate its 10th anniversary. 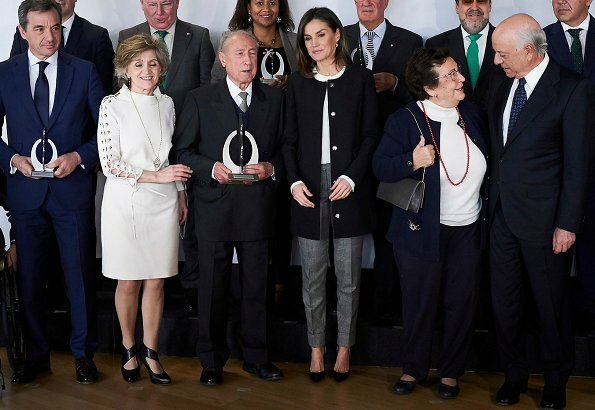 The Integra Awards aim to recognize innovative initiatives that create quality jobs for people with disabilities in Spain. 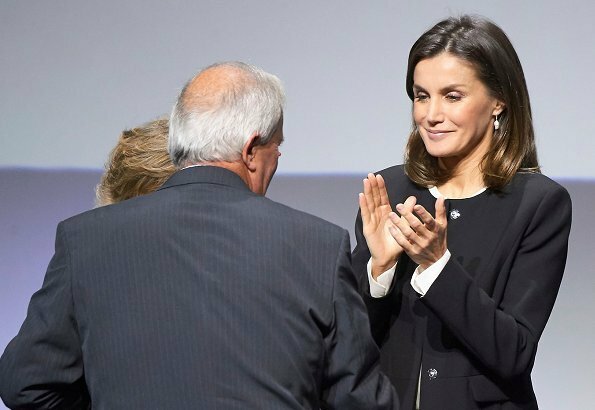 Queen Letizia presented the award to this year's awardee, The John XXIII Roncalli Foundation. The John Roncalli Foundation's origins go back to 1966. The Foundation aims to help mentally disabled individuals in adapting themselves better to both social activities and labour force. Classic look! Love the longer jacket and esp the trousers. They are not too skinny or too wide. Smart and business like but she might have got away with something more flamboyant for an awards ceremony. I do NOT like the shoes the other lady is wearing. This is the 2nd time she has worn these pants. I noticed the first time and now again - the fly on these pants is not fitted well. I would be embarrassed to wear them like that. She looks immaculate as usual. Not only that, but the print on the pants makes me dizzy. The total look is fine but that print is goofy. I do love that shade of lipstick as opposed to the startling red that Princess Charlene likes to wear. Love the outfit. Her hair looks strange as if there is one almost black part and the lower part is brown - maybe it's the lighting but I can see it in more than one photo. Nice outfit not over the top or under, just right. Perfect makeup. Hermosa, práctica y profesional. Parece haber tomado gusto por los cuadros P. de Gales. Hair and make up are perfect. This shows the difference between a pair of well tailored trousers (Boss) and a cheap one... Not even Letitia can make the cheap ones look good. I do admire her willingness to support the Spanish chain. By the way, these are not Prince of Wales checks. Classic and elegant profissional look. Better, once again not news pieces but just a new combination (the coat I'm not sure if is new). No es nuevo, lo tiene hace varios años. Es de Hugo Boss. I was not sure but that was my first thought. Thank you for the information. I think she looks lovely. It’s a simple outfit with clean lines, accessorized beautifully by the clutch and shoes. No hay ningún frunce. Lo que se ve es el pliegue que se le forma a todo el mundo cuando se da un paso. Intento fallido una vez más. What??? This paint is a perfect finishing touch to an elegant suit.The entire look is an example of elegance and fine form. Nothing to do with an office attendan office. 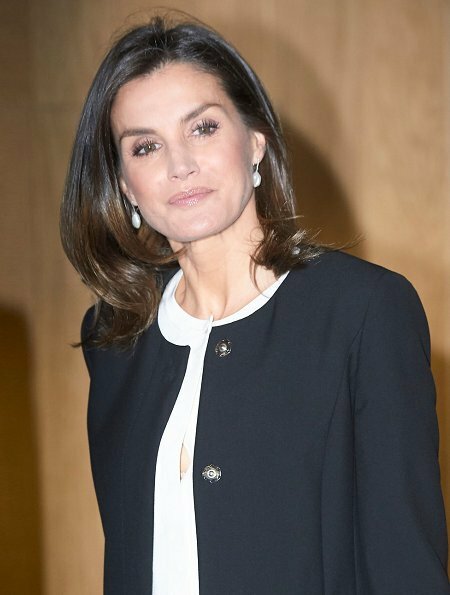 She is a perfect Queen in a modern society at the star of the XXI century , not an actress in second-rate soap opera. She always looks effortlessly elegant. Classy and elegant, queenly Look.